Aluminum door canopies that can be custom made from three feet wide to eight feet wide in one inch increments to fit most any size and style door. 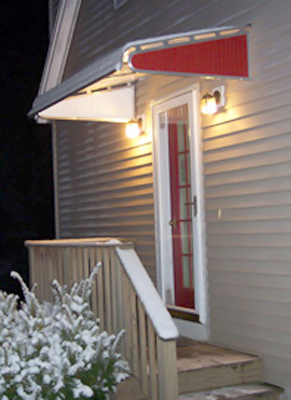 You will find these door canopies in a number of awning projections that can be used for both in-swinging and out-swinging doors. Designed to handle snow loads and is a much better option in northern climates as fabric door canopies are not designed to handle snow loads. 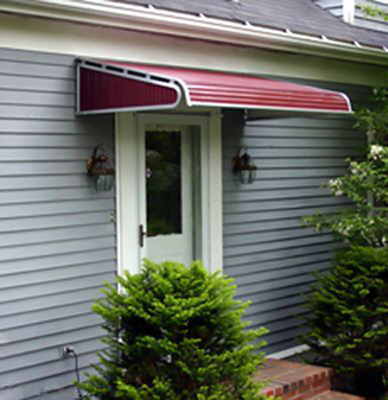 These door canopies are available in a number of different colors and patterns with 13 color choices and are available with and without side wings. The optional side wings come in a standard and low profile style. The low profile can be mounted with as little as 6 inches above the door for mounting space and the standard profile requires a minimum of 13 inches above the door for mounting. A selection of color and patterns can be found by clicking on the color chart located next to the product description. These sturdy well built aluminum awnings carry a five year warranty and are a perfect match for to go with the aluminum window awnings or function just perfectly as a standalone door canopy. 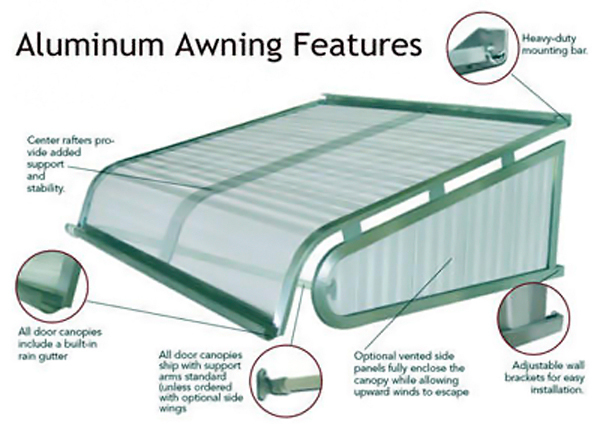 The low profile side wings are particularly useful if you have limited space above the door for mounting an awning as these only require six inches of mounting space. Please e-mail to AwningCenter@Yahoo.com or use the contact form for quotes on aluminum door canopies larger than 120 inches wide.